There are thousands of languages in today’s world so it follows there are thousands of ways to say “Good-bye”. And within this smorgasbord of languages and dialects there are different ways of saying and interpreting “Good-Bye” within each language, depending on familiarity with the person and the situation. Many of my friends are feeling quite celebratory biding “Adieu” to 2009, as well. Therefore, I need an appropriate appetizer to fit the occasion. Inspired by the wasabi caviar I’ve seen refrigerated near the seafood departments at Hiller’s and Whole Foods, I’m making a Japanese-styled appetizer to bring to a couple of parties this evening. These are sushi-loving folks but serving tuna and yellowtail sashimi to a crowd is not in the proposed budget for 2010. This appetizer, however, does borrow some of the flavors appreciated with sushi, and caviar is often a fixture on sushi menus. In Ann Arbor, caviar options are boundless at this time of the year. Most grocers in town carry the shelf-stable Romanoff which is fine for many recipes. If you want the really good stuff, Monahan’s Seafood in Kerrytown offers a wide and interesting array of fresh caviar to accommodate your palate and purse. “After the collapse of the Soviet empire, wild sturgeon was over-fished and Beluga (caviar) was banned from import. We sell a comparable California White Sturgeon, which is milder than a beluga with a smaller roe, selling for $64.00 an ounce,” owner Mike Monahan said. “This would be fantastic savored with a fine champagne, toast points and creme fraiche,” he added. For this Edamame Cup recipe, Monahan recommends their Japanese Ikura (salmon roe) for $60.00 a pound, similar in price to the wasabi caviar I purchased. The large, shiny orange roe would be a deliciously beautiful complement to the Edamame Cups. Next time! Edamame are Japanese soybeans and available in the frozen vegetable section of most groceries in town. Edamame are low-fat, nutrition-rich powerhouses which I will need to help jump start the New Year. Wasabi, often referred to as Japanese horseradish, is a fiery hot condiment and commonly mixed with soy sauce to savor with sushi. Short on time? Just make the edamame spread and place in a dish edging the rim with caviar and garnishing the top with toasted sesame seeds. I enjoy serving edamame spread with Kame rice crackers. Note that the recipe easily doubles to utilize a one pound bag of edamame, making two cups of spread. A good chilled sake would be the perfect accompaniment to this appetizer. Pick your favorite language and honor me by joining in a global farewell to 2009. Here are a few options to get the chant started: Adios, Ciao, Namaste, Zan Jian, Auf Wiedersehen, Do Widzenia, Shalom, or my personal favorite…Ta-Ta! 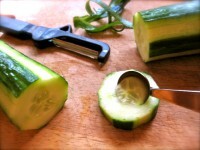 If serving in cucumber cups, using a melon baller or metal measuring spoon, make a hollow in the top of each cucumber piece, making sure not to penetrate the bottom of the cucumber cup. Place pieces on a platter lined with paper towels and lightly sprinkle with kosher salt. Let excess moisture drain from cucumber cups for 30 minutes, then lightly wipe moisture from cucumber cups with paper towel. Meanwhile, boil the edamame in salted water to cover until tender, about 5 minutes or according to package instructions. Drain and reserve about 1/2 cup of cooking water. In a food processor, purée the garlic with 1 teaspoon wasabi, oils, 2 teaspoons soy sauce and 1 tablespoon rice wine vinegar. Add edamame and process, adding just enough reserved cooking water, until a smooth purée suitable for dipping is achieved. (Note: if you are piping the purée into the cucumber cups using a pastry bag, you will want to make sure the purée is a silky smooth consistency.) Stir in chopped cilantro. Add additional wasabi, soy sauce and rice wine vinegar to taste. 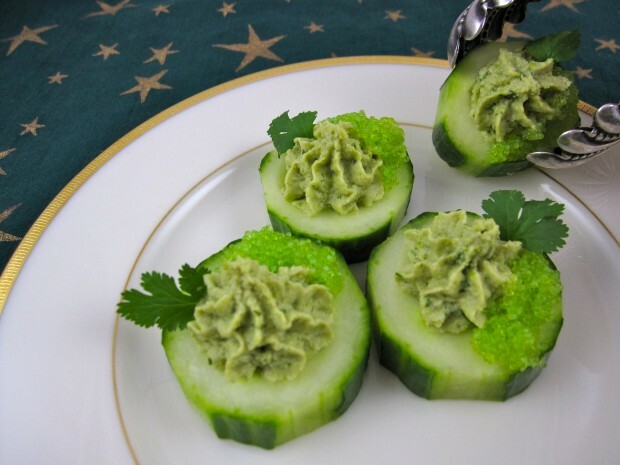 If serving in cucumber cups, with a pastry bag, pipe about 1 teaspoon edamame purée into each cup. Garnish each Edamame Cup with 1/4 teaspoon wasabi caviar and a cilantro sprig. * Wasabi may be purchased at most groceries in a paste or dry powder form. I prefer the flavor of dry wasabi and easily reconstitute it with a tiny bit of water.